Life = change. Just Breathe. Our family home is being sold. Change is afoot. I am acutely aware this week of the practical issues of moving, releasing, gifting and attending to all matter of items .. including our beautiful Quiet Mind shop stock. This morning after meditation .. 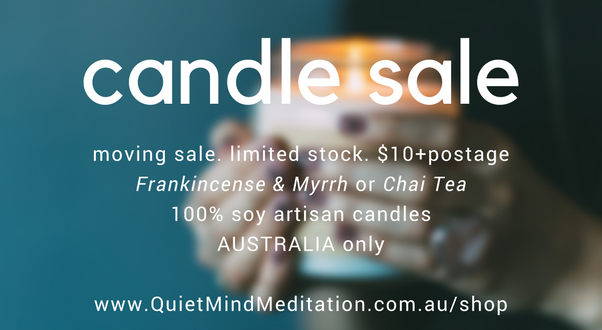 I realized it was time to release our beautiful artisan crafted 100% soy candles into the world (and out of my cupboard, that itself is going). These are the two fragrances that I chose for my first Quiet Mind Meditation candles .. both evocative, mesmerizing and gentle for our meditation practice at home.